I keep getting stress fractures, is that normal? Stress fractures are not normal. 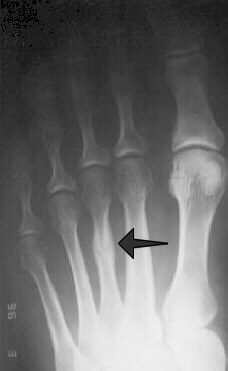 A stress fracture is a non-displaced fracture in a bone which forms because of increased stress on it. When a stress fracture is treated properly and heals, the bone should return to full strength. A stress fracture can recur after it heals. There are two possible reasons why this happens. The first reason is a repetitive and recurrent force on the bone. This can be a problem in runners and other athletes of all levels. The persistent force causes your bone to break down and ultimately fracture. When this happens it is important to get treatment right away. Treatment includes immobilization in a cast boot. In some cases crutches may be necessary to use. If the excessive pressure on the bone is not properly managed, the fracture can recur. The best way to avoid this situation is to address the stress on the bone. This is most commonly addressed by using a custom orthotic device. This is a specialized insole designed to redistribute pressure and increase the stability of the foot and ankle. The second reason a stress fracture can occur is due to an inherent weakness in the bone. This can be caused by a demineralization of the bone causing osteoporosis. It can also be due to a weakness in the bone due to poor circulation coming into the bone. In both of these cases, the underlying issues must be addressed as well as the fracture. My patients like to differentiate between a broken bone and a fracture, thinking a fracture isn't as problematic. The truth is a fracture IS a broken bone and must be treated as such. If you are dealing with foot or ankle pain, or if you have had recurrent stress fractures, contact Houston podiatrist Dr. Andrew Schneider for an immediate appointment.